If college is the best four years of your life, then big sis week for 1st year sorority girls is the best week of those four years. This semester has been such a whirlwind of activity, I can hardly believe that it’s almost spring break. I just joined Pi Beta Phi sorority and last week was my big sis week! Big sis week is essentially a week of pampering given to you by a mystery older girl in your sorority who is later revealed to be your big. 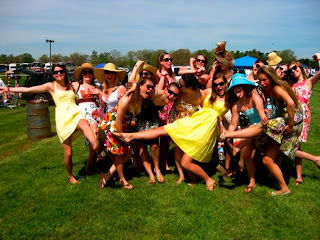 At UVA, the older girls go all out. A basket arrives each morning of the week filled with sorority gear, homemade goodies, and a schedule for the day. My big packed so much in for me during the week that I can hardly remember half of it. Some of my favorite activities included swing-dancing lessons, a trip to a ceramics painting store, tye-dying, and (see below) the annual Pi Phight. We made quite a mess on Sunday morning at the Pi Phight to say the least. On Monday, my entire pledge class trekked to the Rotunda for our revelation ceremony and finally I found out who my Big Sis was! 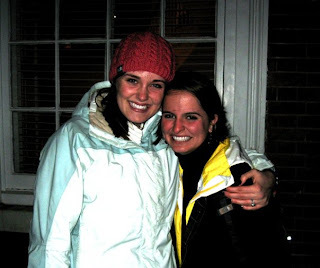 When I learned I had missed a huge snow storm in Virginia when I went home for winter break, I was really bummed. Being from Boston I get to see snow all the time, but I had never seen snow on Grounds! I remember my first year it snowed once, at three in the morning, and I slept until eleven when all the snow had already melted. So for me, a snowy Lawn was just a dream. So I was pretty pumped when the weather forecasts predicted a "huge" (for Virginia) storm was going to hit C-Ville! We ended up getting in between one and two feet, and the University was transformed into a winter wonderland. It's one of my favorite memories of UVa so far! I went sledding for three days straight, and discovered that trash bags actually make awesome sleds although you do tend to get a little snowier. 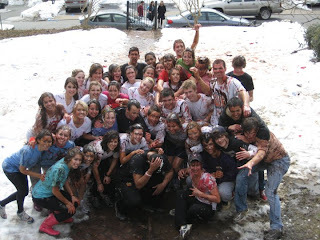 There were tons of giant snowball fights on the Lawn, and some brave streakers even dodged the snowballs as they ran. I visited one of my friends on the Lawn, and we made smores over the fire and drank hot cider as we watched the snow falling outside and people shoving snow in eachothers faces. Instead of the University shutting down, everyone geared up in all their snow layers and ventured out into the blizzard to have some fun. There are still the remnants of giant snowmen, igloos and snow forts on the Lawn as I walk by every morning. And although the snow is starting to melt as it gets warmer, I keep checking the weather and hoping for another big storm! One special event that comes to the University of Virginia's School of Engineering and Applied Science every year is Engineering Week. E-week hosted by the Engineering Student Council (Estud) and features a variety of events that have to do with the week’s theme. This year the theme is the Elympics, a clever play on words because it just happened to coincide with the first week of the Winter Olympics. This year, E-week featured fun events, such as a Lego building competition, a root beer keg-kill, Rock Band competition, and human Tetris. If these all seem to "out there" for you, engineering students could also enjoy several free meals provided by the various departments within SEAS. E-week is a time for engineers to show their pride and hopefully provoke a little sympathy from our college counterparts as members of Estud have been giving away "Hug me I'm an Engineer" buttons; cause let’s face it, even us e-schoolers need some human interaction in our lives. E-week ends with a Friday night get-together, better known as f(date), if you don't get it, it's ok...we do. This is all one of the reasons I love UVa, not only are we a top-ranking school academically, but not a day goes by when you don't get to do something fun or try something you've never done before. If you want to see more about E-week you can go to, http://www.student.virginia.edu/estud/eweek2010/index.php. One of my most meaningful involvements here at UVa has been my membership in my sorority. My sorority has provided me with lifelong friends, academic support, community service opportunities, and thousands of fond memories. A few weeks ago, UVa’s Inter-Sorority Council and Inter-Fraternity Council held formal recruitment (usually referred to as “rush”), offering first and second years the opportunity to consider joining a sorority or fraternity. The UVa Greek system is a strong and vibrant community; 1,500 females belong to 15 different houses and 1,800 males make up the 28 fraternities at UVa. While some universities hold rush at the beginning of the fall semester, UVa defers recruitment to the start of the spring semester. I personally believe this system to be ideal, as first years are able to spend their first semester of college meeting people and making friends in their dorms, classes, and various organizations. Rush itself is a really positive experience, as individuals are able to meet all kinds of new people through the process. UVa’s Greek Community is a diverse body full of interesting and passionate individuals, and my experience as a member of a Greek organization has been absolutely wonderful, providing me with a home away from home. Please feel free to contact me if you have any questions about sororities and fraternities at UVa! I am a part of Black Student Alliance and every year we are involved in helping the MRC (Minority Rights Coalition) decide which person we want to endorse in the numerous elections that go on around this time of year. Today I was a part of the interviewing process of the different candidates and it hit me just how well UVa prepares its students for the real world. Every candidate we interviewed was very professional and came with a thought out platform. The entire process was just like something that would happen out in the real world, and it just goes to show how much of a community UVa is. 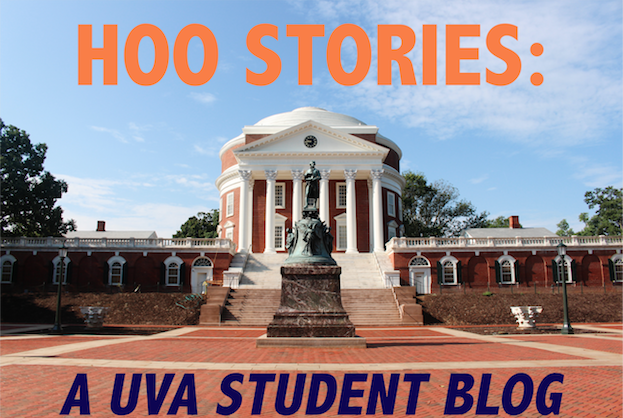 UVa is more than just a university; it is a collection of individuals that want to improve not only the UVa community, but the surrounding communities and more. UVa is a great place to not only learn through classes and professors but also through our fellow students. UVa is a great community to learn and grow in. Among countless others, one nice thing about UVa is that, here, students in the College of Arts and Sciences aren’t required to declare a major until the end of their second year. I’m sure the purpose of this is to allow for all of us students to take a wide array of different courses before committing ourselves to one path, but I’d like to think it’s also secretly, in part, due to the fact that the administration knows, and embraces, the fact that we’re all procrastinators at heart. Regardless, however, this practice gives us the unique opportunity to really explore our interests, because, let’s face it, after college, when are you ever going to take a course about the history of the circus (which, believe it or not, is shockingly popular here)? If there was any one piece of advice concerning academics that I wish someone had given me during my first year at the University, it would definitely have to be this: take the classes that you genuinely have an interest in, and worry about filling requirements (area or major) later; chances are you’ll end up inadvertently completing the latter while doing the former, anyway. With UVa offering so many unique courses (Anglo-Saxon History, Age of Jefferson, Myth and Reality of Espionage… I could go on and on…), it would be a shame to limit the spectrum of subjects to choose from because of something like a major. Admittedly, this is important, but not as important as most students are led to believe upon entering first year (besides, almost half of college students change their major at least once during the course of their college career). So, when deciding on courses for fall 2010, which seems a lifetime away, but will probably be here before we can blink, keep your options open, and if necessary, use all of your available resources by not hesitating to email any one of us with questions! Echols Scholar--Is It Worth It? I have to admit that one of the biggest selling points for me in choosing UVa was that I was chosen as an Echols Scholar. For those unaware, Echols is an Honors Program in the College. Its brother program in the Engineering School is the called Rodman Scholars. Due to some interesting moves on the part of the administration, some of the Echols' privileges have changed, and so it really is worth pondering if the program still has its once admired beauty or if it's rather fallen into the gutter. Well, let's go ahead and get the obvious out of the way. The Echols Scholars program is just that--a scholars program not a scholarship program. There is no money or grant inherently tied to the title, but that's hardly a change. After all, being an Honors student here at Mr. Jefferson's University is supposed to make up for it. Let's see how it tallies up. The part in italics is the new change. It used to be that Fourth Year Echols Scholars enrolled for classes, then Third, Second, and First Year Echols, and then Fourth Year, Third, Second, and First years registered for classes. Thus, an entering First Year Echols signed up for classes before Fourth Year students who were not Echols. Now, Echols sign up for classes first within their own class. Alright, I have to be honest here. I think that that is a poorly thought out and an altogether abysmal change. I took a 300 level class my first year. What good does registering within my own class do when I want to take higher level courses? The entire point of the program is course freedom, which totally flies out the window when three quarters of the school has signed up before you. It's a bad idea. Now, if they wanted to let Fourth Year Echols, Fourth Years, and then the rest of the Scholars, I would find that agreeable, but as it stands, I think it's an atrocious idea that really takes a lot of power away from the program. The saving grace is that if you are Echols and you go talk to a professor, chances are they'll try to bump you (via course action forms) into the class. HAHA! This is truly spectacular. Hands down, this feature is the glowing selling point now, the absolute beacon of the program. You want to come to the University as a Scholar and bury yourself so deep into math that you don't know where Bryan Hall is? Fine. You are not required to take English. Hate French? Don't take it. You have no language, history, math, science--no required courses at all. Move about as you wish. It's glorious. Now, most Scholars do end up filling the requirements anyway (whether through AP credit or exploring different class types), but the beauty is that they don't have to. That privilege alone gives Echols 3,000 cool points. over all much better for it. I still remember talks in the common room lasting for hours, and the excitement was palpable. Ideas sparked and really, it's that thrill that makes me miss the community of First Year Honors student living. Well, that's really up to you. If you want a free ride, try the Jefferson Scholars program because that has a full ride. Echols is mostly academic privileges. If you're after a different kind of package--one that includes crazy dorm stories, academic bonuses, and the dynamic features of a public university like Virginia--I'd definitely keep UVa on your shortlist. For me, I made the decision two years ago, and I don't regret it a single bit. The gyms, athletics, clubs, classes, professors, people; they're all too important and wonderful for me to want to give up just so that I can say I'm in a scholarship program rather than a scholars. This is my current common room window and that is definitely not a pizza box, newspaper, chips bag, or plush sperm cell doll in the spider web decorations one would find around Halloween. There are also zero Mike and Ike containers in the web. Way More Than 110 Things to Do! To echo Janna's post a bit, allow me to indulge some 4th Year nostalgia as well. 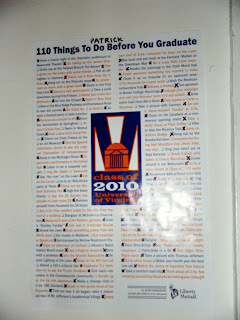 Every fall, the Fourth Year Class Council compiles a list of “UVa Must-Sees” to distribute to all graduating 4th years. My friends and I have been working hard to complete all of the tasks on our list of “110 Things to do Before Graduation” but I still have a few more to check off before I can walk the Lawn this May. For the rest of the semester, I’ll keep you guys updated on my adventures, but I’ll start by re-capping a few of the things-to-do that I’ve already done. “Check out final Fridays at the UVa art museum”- On the last Friday of every month, the UVa art museum opens its doors to students and community members for a special viewing of its current collection. There’s always free food and drinks and the artwork is fantastic. It’s a great way to wind down on a Friday afternoon; after all, you’ve got to save some energy for the weekend! “Celebrate TJs birthday, try to see the purple shadows”- Everyone loves a good birthday party, but especially in honor of our founder, Thomas Jefferson. On April 13th, the community comes together to celebrate Mr. Jefferson’s birthday on the Lawn, and Founders Day events have been some of my fondest UVa memories. And if you can manage to stay up all night, you may even catch a glimpse of the Purple Shadows (one of our many secret societies) processing down the Lawn to place a wreath at the Jefferson statue. “Visit Edgar Allen Poe’s Room” – Though he was only a UVa student for a brief period of time, we still herald Edgar Allen Poe as one of our favorite alumni. His room, 13 West Range, is still preserved with original furniture and stands as a monument to the brilliant writer. There’s nothing more inspiring than walking to class along the same route once walked by Poe, though I’d steer clear of the area on Halloween.